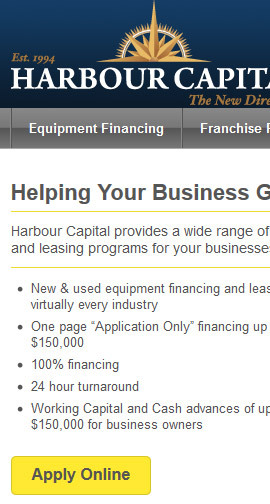 Harbour Capital is a full service business to business equipment financing company. Founded in 1994 by equipment finance professionals, HCC has grown into an industry leader and one of the nation's largest independent equipment finance companies. They specialize in providing creative and cost effective solutions to small and medium sized businesses in all 50 States and Canada. Nichole Dinato and I worked closely with our point-of-contact at Harbour Capital to make a business requirements document. We provided client with multiple mock-ups and made adjustments until we got approval on final design. I set up the server and set up the SSL certifications with HostGator in order to allow Harbour Capital to securely capture client data. Configured the production and the development servers, installed WordPress, used Subversion for version control. I did a lot of customization on WordPress for this project – I created a custom WordPress theme and several plug-ins which allowed the client to enter and update information for different pages on their own. Created an online application that allowed users to fill out a secure online form instead of filling out and emailing a PDF, which was the process prior to this project. Set up a blog so they could begin posting informative articles to drive SEO.